Larger version (2,000 x 1,600 pixels). The frequency of dense New Testament streaks in the Old Testament, especially in Leviticus and Deuteronomy; I didn’t expect to see them there. The loops in Samuel / Kings / Chronicles and in the Gospels indicating parallel stories. The sudden increased density of New Testament references in Psalms through Isaiah. The eschatological references in Isaiah and Daniel. 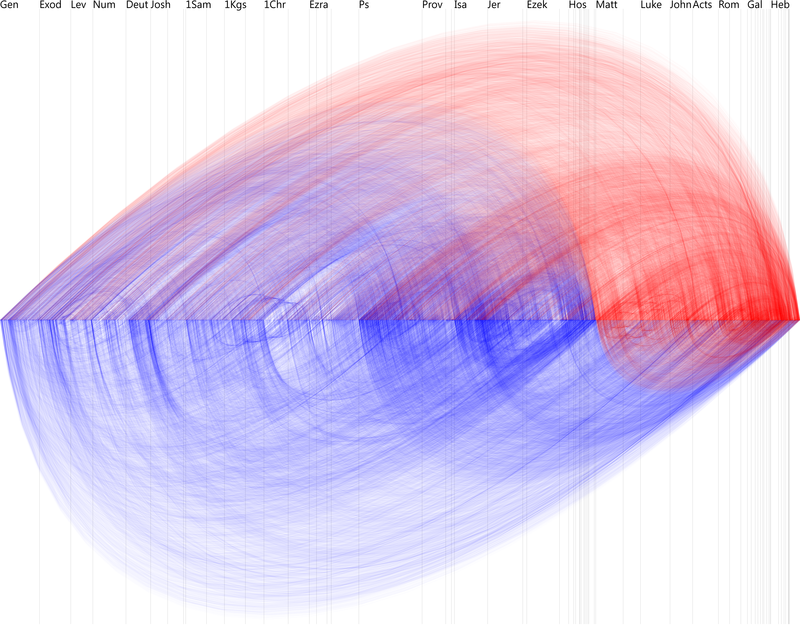 The density of references from the Minor Prophets back to both the Major Prophets and earlier in the Old Testament. The surprising density of cross references in Hebrew-Jude. The asymmetry. If verse A cites verse B, verse B doesn’t necessarily cite verse A. I wonder if I should make the data symmetrical. You can also download the full-size image (10,000 x 8,000 pixels, 75 MB PNG). It’s a very large image that could crash your browser. If you want it, I strongly recommend that you save it to your computer rather than trying to open it in your browser. This visualization uses data from the Bible Cross References project. I used PHP’s GD library to create the graphic. Inspired by Chris Harrison and Christian Swinehart’s wonderful Choose Your Own Adventure work. This entry was posted on Friday, April 16th, 2010 at 7:55 am	and is filed under Cross References, Visualizations. You can follow any responses to this entry through the RSS 2.0 feed. Both comments and pings are currently closed. 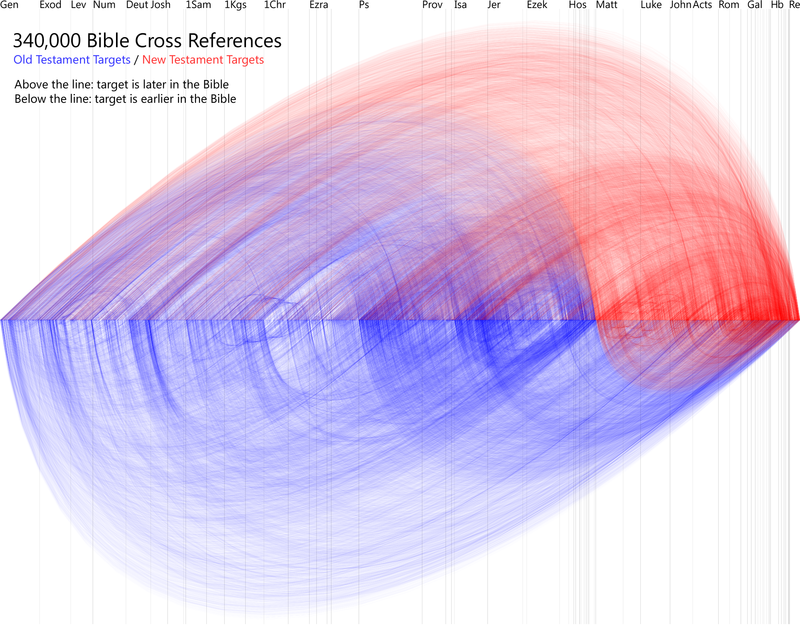 Also check out other Bible visualizations. The one showing Twitter verse popularity is probably my favorite, as it’s dense yet approachable.